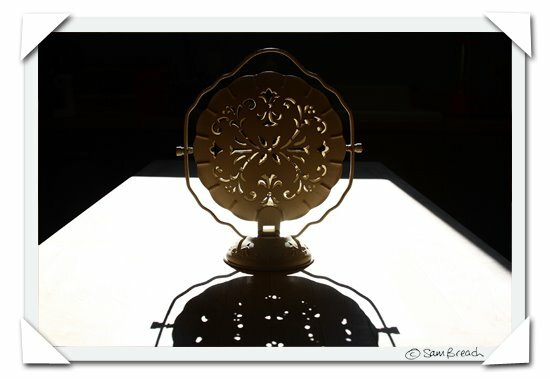 It's either a hood ornament, a monstrance, or a cute little cookie tray that unfolds and looks lacy and doily-like at your next spring party. I think it's a folding cake stand. My guess would be a lamp finial of some sort. I agree with toffeeapple. I think it's a folding cake stand. I was going to say it was an old-fashioned gizmo for making toast, but now I have to agree that 'folding cake stand' is very plausible. Oh, I think I have one of these in green. Folds out to three little trays for goodies! have you been carving root vegetables into facsimiles of buddhist temple gongs again, sam? I'm confused by whether that's a shadow or part of the "what is this?" but the more I look at it the more I think it's a decorative mold. For butter? Or is it a device for making thin crisp cookies, like Italian pizzelle??? Is it for making powdered sugar designs on cakes? Any which way, its a stunning photo! An old fashioned toast maker??? Or a napkin holder? Okay, bad guesses, but I had to try. Looks like a sugar, um, melter for absinthe. Sort of. my first guess was a pizelle press... but I dunno... a trivet of some sort?